Continuing our current theme of the history of exploration today’s timeline looks at some of the most important explorers from the Age of Discovery. This is by no means a complete list, rather an overview of some of the more important explorers of their time who have been selected for this timeline for their involvement in some of the major explorations of the age. In 1488 Dias become the first European to sail round the southernmost tip of Africa. Although Columbus wasn’t the first European to reach America, his voyages Between 1492 and 1500 led to the first lasting contact between Europe and America and initiated the Spanish colonization of the New World. In 1498 Gama became the first European to reach India directly by Sea. The route was one of the most important discoveries during the Age of Exploration and paved the way for the Portuguese colonial empire in Asia. Magellan’s expedition of 1519–1522 was the first to connect the Atlantic and Pacific (the passage was made via the Strait of Magellan) and the first to cross the Pacific. After Magellan’s death in the Philippines Elcano took command and completed the first circumnavigation of the globe. 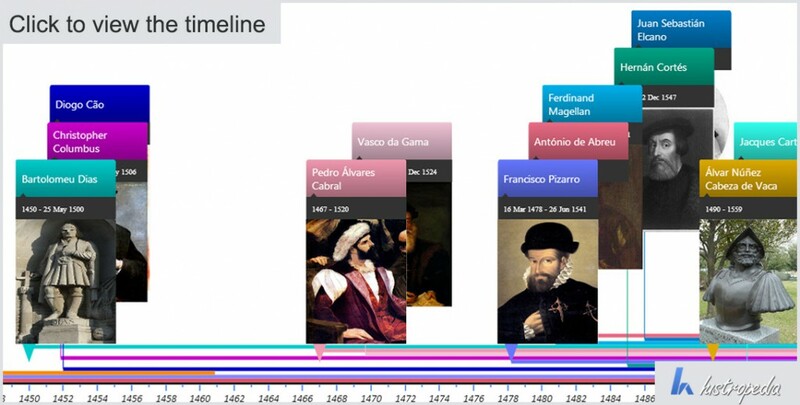 View the entire timeline to discover more amazing explorers and learn about the expeditions that made them famous. Thanks for your comment! If you would like to let me know why you haven’t enjoyed the site or timeline we can look at ways we might be able to improve Histropedia, we are still in beta and all feedback we can act on is highly appreciated.